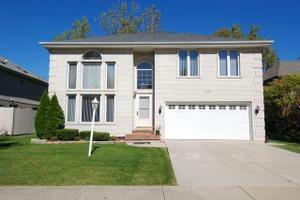 Beautifully Maintained & Updated Brick Home in A Lovely Cul De Sac. Two Story Living Rm W/ Gorgeous Oak Floors. Brand New Kitchen With S/S Appl, Glass Backsplash & Granite Counters. Family Rm W/ Wood Burning Fp. 2Nd Fl Boasts 3 Bedrooms Plus A Loft Which Could Easily Be Converted To 4Th Bdrm. All Baths Recently Remodeled With Today's Buyer in Mind! Huge Fin Bsmt With 1/2 Bath. Nothing To Do But Move in and Enjoy!